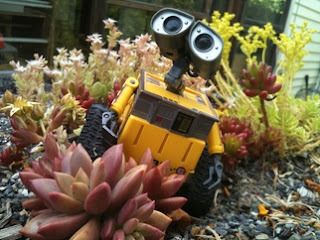 A blog about sustainable landscaping and some eco-humour and eco-creativity. Inside this blog we look at everything that is encroaching in to our natural urban landscapes – outdoor rooms (errchkem), weeds, urban noise, excess nutrientsThere’s a bit of art to add extra colour and inspiration. We believe in making sustainability fun - more gaming, less shaming. To contact us – go to the contact us page http://www.converseconserve.com as the contact facility on this blog has been giving us mischief. Andrew Jones, talented artist and designer. 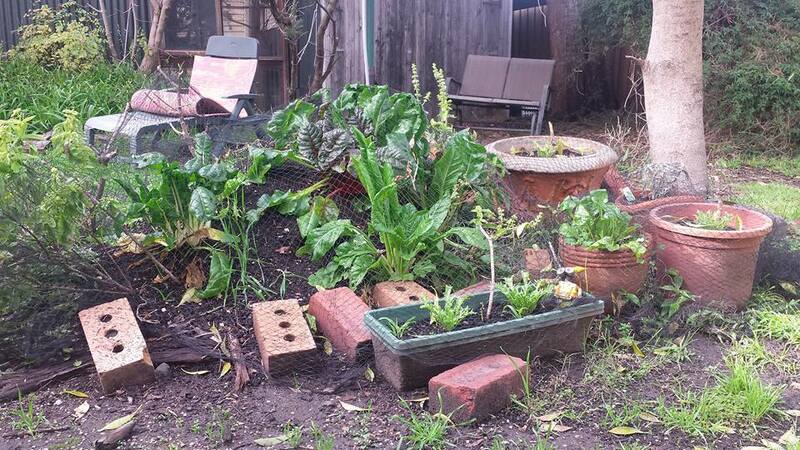 My Hugelkultur is going strong twelve months on (poetically put, I might add). 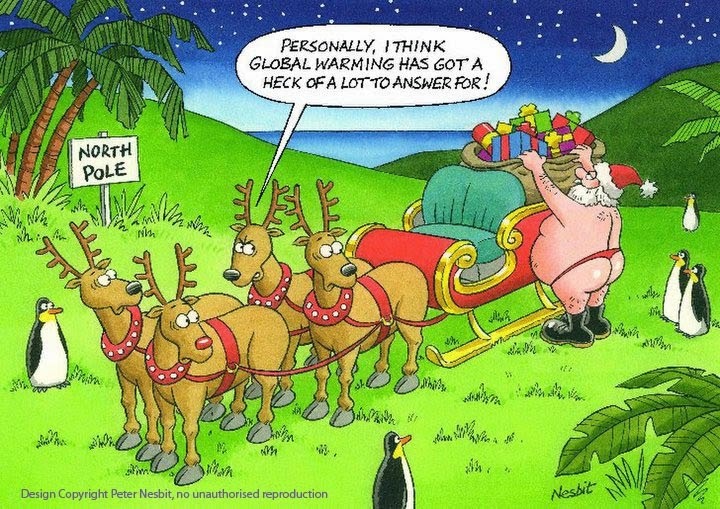 Winter has kicked in later than usual. Yesterday I took my bike for a ride along the Merri Creek and around to a Community Garden in Brunswick and I checked out a few of the basil plants in the shared garden and they were well and truly 'kaput' - 'finito'. The man diligently planting up his plot said they had died about a month earlier. Now what a proud moment that was for me. My basil WINS! It's winter in Melbourne and the basil on the Hugelkultur is hanging in there. I gave some to my friend last week when he took me out for my birthday and we enjoyed the basil from the same clump in a salad last night. 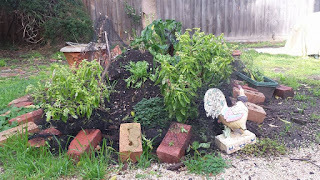 When I planted it up I read online - having a Hugel Kultur 'might' prolong the growing season and yes, I'm very glad to say my Hugelkultur is living proof today that the growing media MUST BE warmer as my basil is still growing (well wilting a bit under the 8 degree conditions). The other benefit about a hugelkultur is that because it's a raised planting bed - there is more tilt towards the sunlight than the lower plants get. See the comparison photos. The Endive recently planted in pots and in the Hugelkultur. The Endive in the Hugelkultur is growing two or three times as fast. There is also the wicking bed (wicker bed?) effect whereby I now rarely have to water it. These mounds are a brilliant invention emanating from Eastern Europe I believe. I must admit the vegie plants were getting established over the summer and they did require the usual daily watering but since Autumn I've rarely watered the HK. The lettuces didn't do so well, but then a lot of them got 'ET' by the possums. What people may not have grasped is the Hugelkultur is a planting mound built up on rotting wood, decomposing branches and twigs, leaves, compost, soil - as long as the materials are not alleopathic (like Eucalyptus, black walnut) and provided they are fully dead - otherwise they will sprout through the mound. One of the disadvantages is the erosion. As I have a strained wrist - too many years of landscaping and home maintenance - I have only topped it up with compost from time to time so it has sunken down a bit. Next one which I will build with HELP will have more straw added to maintain the height. Ideally you need two people to build it! Hugelkulturs RULE! 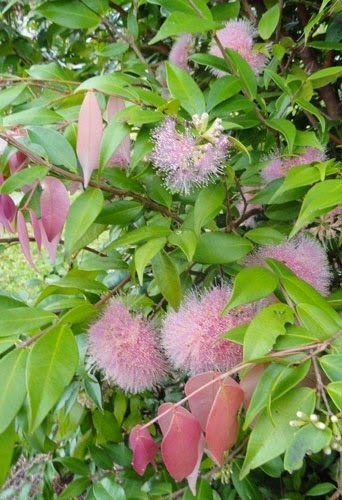 They are a tree recycler, carbon sequestration media, self-watering and give plants a longer time for harvesting. 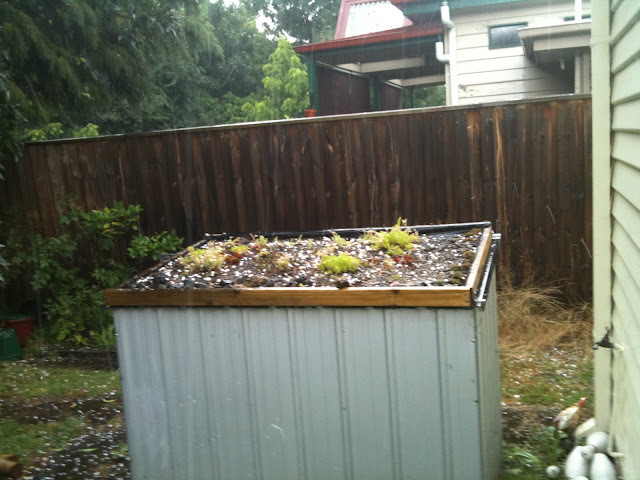 Plus they are great if you have a small garden because you build up not just out. Off to the Darebin Resource Recovery with the aim of collecting some old logs for a Hugel Kultur that I'm building. For any one who doesn't know it's a Tree Recycler, Soil Generator and Improver, Productive and Pollination Plant Mound, Compost and Carbon Sink all in one. After one year they become self-irrigating - assuming all goes well. It's important the logs are chosen correctly so as not to be repellent to other plants - so walnut, casuarina (she-oak), eucalyptus and other allalopathic species are not wood sources to use. These seem to be more popular overseas than in Australia though I aim to change that! Picture courtesy of www.permaculture.co.uk - I trust they are happy for me to use the picture as it is in the interests of a common cause - and Hugel Kulturs don't seem to be de rigeur at all in Australia. This pic gives you a good insight in to how they are constructed. Ideally a swale will be built in too to redirect any water run-off and act as a biofiltration media for the garden. Well, it's a year to the day since we last wrote with a lot of family matters to attend to. Due to a death in the family and another ALMOST death in the family, this blog has been put on hold. Lately we've been researching two ideas. 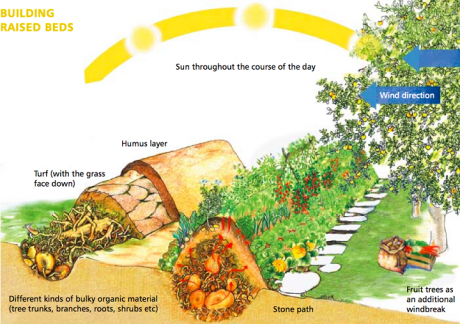 We have been looking in to Carbon Gardening - creating a carbon sink in your own garden via Hugel Kultur,s Sequestering Carbon, No Till Gardening, and Composting in your local environment. There are many ways us residents can SINK a better CARBON SINK in to our back yards. I also had another business idea around sourcing Organic Flowers in Melb ie. posies and flower arrangements sourced from organically produced flowers. There is a supply issue. Organic flowers are a boutique industry in Australia so it is not easy to source the organic flowers, grown fair distances from Melbourne. This is a grave shame as pesticides, herbicides and fertilisers are used en masse in the agricultural industry. Run-off from these pesky soil and plant chemicals from crop production causes contamination to ground-water and riparian systems so that's where organic flower production may belong moreso in a Utopian world. With broad acre farming, agricultural soils are being rapidly depleted of biota/ nutrients. With loss of topsoil, and erosion, salinity and desertification are all major worries for farmers and environmentalists across the world. We need to be encouraging crop rotation, green manuring, companion planting, to allow the soil to replenish itself. Broad acre farming just isn't sustainable in the long-term. See relevant labels from previous posts. I've also been spending a lot of time on our Education Pages of our other Website - Converse Conserve.com and our Facebook page. There are Slide shares as well to pique an interest in sustainability - and in the Powerpoints are activities and games for teachers to try in their lesson plans. 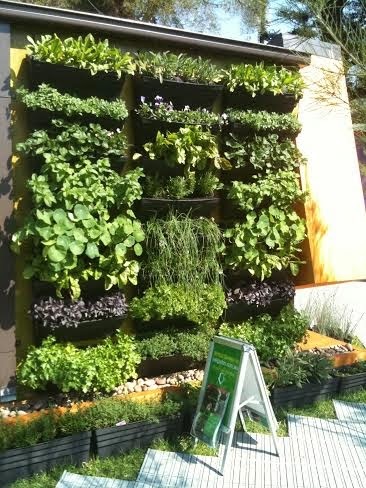 Speaking of education and inculcating a love of nature and interest in sustainability - here is a blog - Live In Art - Ten Natural Garden Ideas for Children. There is a growing movement internationally to get children back out in the garden - and off their computers and I Pads. I regret to advise that due to the serious illness and then the loss of a close family member, there has been little or no activity on this blog in recent months, but we aim to get back and be inspiring sustainable gardening again, once the dust has settled, pardon the pun! Very surprised to hear that the Swinburne TAFE Sustainable Landscape Design course will be taking no further enrolments, due to a cessation in funding. That means a relatively small number of us actually will possess this EXCLUSIVE qualification, after only three years of Swinburne's running the course! No question it's a male dominated field, and highly competitive field to break in to as a full-time vocation, especially when it comes to design work. People very often source their ideas from the internet, rather than feeling they need to pay a Consultant. With less government money being directed at sustainability with State and Federal Governments being both Liberal/National now. Taking the good with the bad, I am honoured to be among the smallish number of students who came through this exclusive Course, with Distinction Results, and look forward to meeting up with staff and students at our Reunion in a few weeks. Sometimes it pays to say less doesn't it!